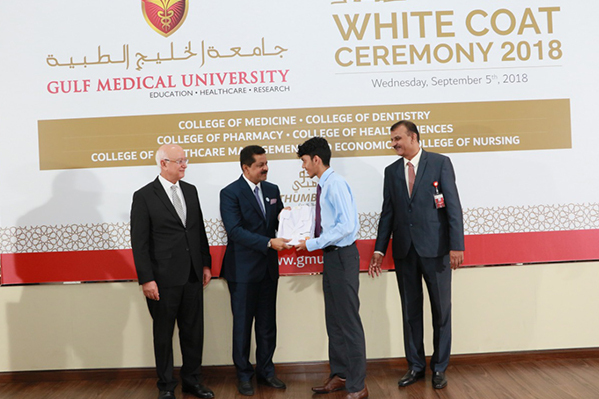 400+ new students of Gulf Medical University, the biggest private medical university of the Gulf region, donned their white coats – the mantle of the health profession, and took their Medical Students’ Oath as they were formally inducted into their respective medical courses at the White Coat Ceremony held at the University campus on 5th September 2018. The ceremony was held for the new students of Medicine, Biomedical Sciences, Associate Degree in Pre-Clinical Sciences, Physiotherapy, Dentistry, Pharmacy, Medical Laboratory Sciences, Medical Imaging Sciences and Anesthesia Technology. 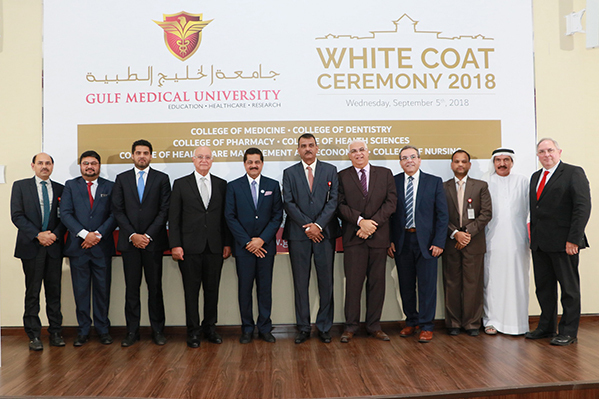 Dr. Thumbay Moideen, Founder, President Board of Trustees, Gulf Medical University was the chief guest of the White Coat Ceremony. Prof. Hossam Hamdy, Chancellor of GMU, presided. The ceremony marked the first step in the healthcare careers of the new students who are now part of GMU’s 80+ nationalities-strong student community. Dr. Thumbay Moideen thanked His Highness Sheikh Humaid bin Rashid Al Nuami, UAE Supreme Council Member and Ruler of Ajman, for his continuous support for Gulf Medical University, which has become an academic beacon and home for pioneering research and innovation, and the place where UAE doctors and medical professionals are qualified to provide the best healthcare. Prof. Hossam Hamdy formally welcomed the new class of students. Stressing the importance of human communication and interaction in the medical profession, he said, “Medical sciences will always rely on communication between human beings. The patient, the student, the healthcare provider and the medical educator are all humans. How to communicate, connect and interact and feel will play a key role in educating Health professional. We will train you on how to be a better communicator.” He reminded the new students that Professionalism, Care & Empathy and Trustworthiness are the three core principles of their chosen career. He added that Gulf Medical University is internationally leading in education technology development. This year, (GMU) launched two new colleges; the Nursing College and College of Health Care Management and Health Economics, which brings the total number of colleges to six. The University offers 23 accredited courses, with additional courses awaiting accreditation, expected to be added soon. GMU has active collaboration with a number of prestigious universities around the world as well as world-renowned research institutes. The Gulf Medical University Academic Health System (GMUAHS), the only private Academic Health System in the region, links the healthcare, medical education and research functions on its own. Research is an important strategic direction of GMUAHS. The Thumbay Research Institute for Precision Medicine leads research in the field of cancer biology and immunology, with international collaboration with France, Poland and Korea. The strategic plans of Gulf Medical University include increasing its global footprint by setting up three new medical university campuses in three different countries, and transforming into a research-based university by 2025.